UKs leading seaside resort gets ready for an incredible 4-day summer extravaganza of land, sea and air display entertainment… it’s more than just an airshow! 31st March 2014: The 2014 Bournemouth Air Festival, supported by Mouchel and City Fibre Gigler has been launched and this year’s incredible line up features 4 days of the Red Arrows displays, a host of land, sea and air assets from the Royal Navy, Pier to Pier county show trading stalls and the return of three fantastic evenings of Night Air entertainment … certainly proving the 2014 Festival is set to be much more than just an airshow! With entertainment on land, sea and air the 7th Bournemouth Air Festival will be welcoming back aircraft favourites and a number of Festival firsts as well as the new Patrons 100 Club designed for local businesses and individuals with a passion for aviation. Last year organisers successfully funded a third Night Air display and again the intention is to organise three evenings of entertainment and bridge the early evening gap with even more flying and music! If last year was big, this year is bigger and better as the Royal Navy demonstrates their land, sea and air abilities. At sea will be a 4 ship fleet, which includes the French Navy’s FS Sagittaire alongside the RFA Argus, HMS Westminster and HMS Mersey, in the air check out the return of the Black Cats Helicopter Display Team, Royal Navy Historic Flight and Sea Kings. On the ground will be an impressive joint Army village area, hosting the much anticipated amphibious demonstration. Celebrating the 350th anniversary of the Royal Marines, there will also be unarmed combat demonstrations and the historic Beat Retreat performed by The Band of Her Majesty’s Royal Marines Collingwood. With a full allocation of RAF display aircraft, the UKs leading seaside resort is set to welcome back the Red Arrows on ALL 4 days of the Festival, a first for the event, and the mighty Typhoon Friday, Saturday and Sunday. In addition get set for the Tutor, Tucano, RAF Falcons Parachute Display Team and incredible Battle of Britain Memorial Flight displaying with the Dakota, another first for this year’s flying programme. The onshore interactive Forces village areas, the Royal Navy at the heart of the Festival with the Army and Royal Marines, and the RAF located in the Waterfront at Pier Approach area, will give Festival goers a chance to find out more about each Force as well as talk to those with first-hand experience, check out displays, speak to the Careers teams, charities and have a chance to try out military equipment. Setting Bournemouth Air Festival apart from the other air events is the stunning Night Air programme. Supported by the Patrons 100 Club members and their Ambassador local hotelier David Bailey they will again be funding three nights of evening air displays as well as supporting this year’s Air Festival charities. The entertainment certainly doesn’t stop with the last aircraft as there will be live music at the Bournemouth stage and big name acts and live music on the Wave105 Corona music stage at Boscombe Pier, Thursday, Friday and Saturday nights until 10pm. With announcements of civilian aircraft participation still to come, as well as the Wave105 Corona stage line up and huge seafront and cliff top trading areas the 2014 Air Festival is certainly set to be the event of the summer! 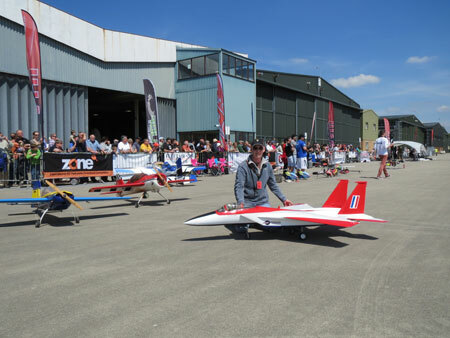 The international RC Air Show showcases the best radio controlled flying displays from around the world. This two day international radio controlled helicopter and fixed wing event attracts contestants from around the world including the world No 1 helicopter Pilot Jamie Robertson from the USA – Also other big names:- Nick Maxwell (USA) Ben Storick (USA) Dunkan & Jon Bossion (FRA) Timo Curlis (GER) Duncan Osbourne (UK). Jamie Robertson’s youtube videos have been seen by over 1 million people! Sunday 25th will see the Zone helicopter competition knock-out events taking place. The final competition will take place on Bank Holiday Monday May 26th. Throughout the Museum there will be traders and experts in the field of radio controlled aircraft to give help and advice to modellers of all levels of experience. Tickets for the event are available on-line through the Museum’s website www.fleetairarm.com or in the Museum shop. Normal Museum entry prices apply and there is no additional cost to see the show. Those wishing to enter on Sunday by making a Gift Aid donation will be able to re-enter on Bank Holiday Monday free of charge. At the recent launch for this summer’s RAF Cosford Air Show, organisers unveiled more information about aircraft confirmed to take part in the thrilling six-hour flying display. The announcement that the ever-popular Blades and the exciting four ship Yakovlevs are both coming on 8 June, as well as the Red Arrows, brings the total number of aerobatic teams up to three. Other aircraft that will feature include two which support this year’s special photo-reconnaissance theme – the Canberra PR9 and the Spitfire PR11. For the Spitfire it will be “welcome home” to RAF Cosford where she was based for a time during WWII. The jet line up includes the classic Hunter T7 and the RAF Typhoon and at the other end of the scale will be the distinctive pair of Boeing Stearman biplaneswith the BreitlingWingwalkers and the classic aircraft of the Great War Team. On the ground three large hangars will feature interactive displays covering the wide range of engineering and technical skills taught at RAF Cosford, with one totally dedicated to a Science, Technology, Engineering and Maths exhibition and all of the individual specialist schools each having their own area, many including the chance to get that all-important photo in the cockpit. One ground display unique to RAF Cosford will be a line-up celebrating the 50th Anniversary of the first light of the Kestrel, the prototype for the Harrier. The RAF Museum’s beautifully restored Kestrel will be brought up to date with static examples of the Harrier GR3 and GR9 and the naval variant the FA2, on special loan for this year’s celebration. Advance tickets are on sale now at £20 with children under 16 coming free. The man who will step into the shoes of Tim Prince, as Chief Executive of the RAF Charitable Trust Enterprises following RIAT 2014, says he feels privileged to be taking over such a unique organisation. Andy Armstrong, whose appointment was announced this week, said he hoped to use his business experience to give something back to the RAF family. Andy, who is married with two children, will be working closely alongside Tim throughout the build-up to this summer’s airshow before formally taking over immediately after. A marketing graduate, Andy has a strong track record in developing a wide range of consumer businesses, most recently managing the transition from physical to digital delivery of filmed entertainment as Managing Director Northern Europe for Sony Pictures Home Entertainment. He believes his interest in the Royal Air Force and his desire to support it was inherited from his father, who was the ATC Corps Chaplain for more than a decade. On leaving school, Andy was awarded a Cadet Flying Scholarship, which enabled him to obtain his Private Pilot’s Licence and he continued flying with the University Air Squadron whilst studying at Strathclyde University. Tim said he was pleased to be handing over the reins to someone who not only valued what had been achieved in the past but who had the experience to take the organisation forward. Andy, who lives in Chorleywood, Hertfordshire, was appointed following a rigorous recruitment process, which attracted a number of very strong candidates. 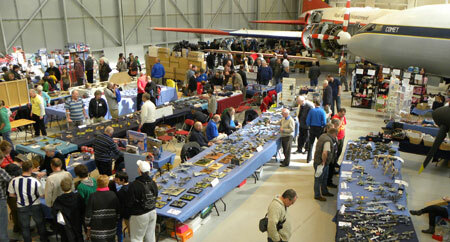 Modelling fans are expected to descend on the Royal Air Force Museum Cosford next month, as they attend the annual Shropshire Scale Modeller’s Show, taking place on Sunday 6th April 2014. Nestled amongst a world-class collection of aircraft and military vehicles will be thousands of intricately detailed models, displayed alongside many of the real aircraft. Boeing has announced that it will be displaying its powerful Super Hornet on the Saturday and Sunday of the Royal International Air Tattoo, July 12-13, 2014. The multi-role fighter, originally developed for the United States Navy but now also in service with the Royal Australian Air Force, has appeared several times at the Air Tattoo in two-seat F/A-18F form since its debut in 2004. Once again, its manufacturer Boeing will lease a US Navy example for the RIAT 2014 flying displays. It will offer a rare chance for a British audience to witness at close quarters the power and manoeuvrability of the Super Hornet, a development of the earlier F/A-18 Hornet that will itself be displayed at the Air Tattoo this year by the Swiss Air Force. 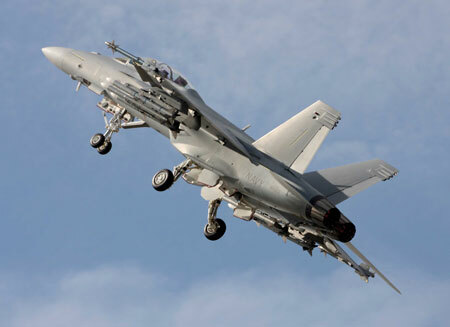 The single-seat F/A-18E and two-seat F/A-18F are both combat-proven aircraft from operations by the US Navy in theatres such as Iraq and Afghanistan. Boeing test pilots have put on some exciting displays in the Super Hornet at previous Air Tattoos, and 2014 will be no exception. Their efforts have featured several times in the RIAT flying display awards, showing the qualities that make the F/A-18E and F so popular with service pilots. The Air Tattoo is staged annually in support of the RAF Charitable Trust. Tickets for the event are only available in advance. Specially-priced Earlybird tickets for next summer’s Air Tattoo are available until May 31 from www.airtattoo.com or by calling 0800 107 1940. All accompanied under-16s go free. Free parking. Plans for the 10th annual Wings & Wheels have got off to a flying start with confirmation from the RAF that the Red Arrows, Tucano and Tutor as well as iconic legends from the Battle of Britain Memorial Flight – Lancaster, Spitfire and Hurricane – will all be part of the weekend’s aviation line-up. The Red Arrows are celebrating their 50th display season this year and recently unveiled a striking new Union flag tail design to their Hawk aircrafts, the most significant change to the look of the Team’s famous aircraft in its history. Headlining the Show on Sunday 24th August, the Red Arrows will also help Wings & Wheels celebrate 40 years since the Hawk first flew from the Aerodrome. As well as enjoying RAF aircraft in action, visitors to this summer’s Show will also get the opportunity to meet some of the pilots and crew, watch over two hours of motoring action on the Top Gear track and participate in the Zones and shows throughout the Arena. The 10th annual Wings & Wheels will be held over the August Bank holiday weekend; Saturday 23rd & Sunday 24th August 2014, at Dunsfold Park near Guildford, Surrey, and is open to spectators from 09:00 until 21:00. Tickets start from £20 for adults, £45 for a family (2 adults and 3 children aged 5 – 15yrs), £6 for children aged between 5 and 15yrs and under 5s are free. Hospitality packages start from £150 per person, weekend passes, grandstand tickets and camping are also available. For more information visit www.wingsandwheels.net or to book standard tickets call 08712 305 572. Wings & Wheels is promoted by Dunsfold Park Limited and in 2014 will be assisting the fundraising efforts of Brooklands Museum Trust and Help for Heroes. THE famous RAF Red Arrows aerobatic team will be the star performer on the first day of Folkestone Airshow, Saturday, June 7, it has been announced by organiser Open Air Promotions Ltd. To round off an exciting day, the Folkestone-based event management company is also to stage a spectacular live concert on Folkestone seafront. Said project manager Yvonne Holder: “It’s wonderful news that Folkestone has been included in this year’s displays by the Red Arrows. The team is in great demand by air show organisers all over the country. Its appearances, of course, are subject to operational requirements. “A fantastic line-up of military and other aircraft has been assembled to thrill residents and visitors during the Airshow weekend. As well as ‘The Reds’, it includes a Lancaster and two Spitfires of the Battle of Britain Memorial Flight, Tucano and Grob Tutor aerobatic planes and the Breitling Wingwalkers, the only formation wingwalking team in the world. “And that’s not all. Starting at 7pm, we are presenting ABBA Björn Again plus multi-instrumentalist star Chris Andre plus a grand firework finale. It’ll be an evening to remember. Ticket information is posted on www.folkestoneairshow.com“. The timetable of events in the air and programme of displays, exhibitions, entertainment and activities to be held on the Leas and in the harbour area on June 7 and 8will be announced shortly. Shepway District Council leader Cllr David Monk said: “I am pleased that the Red Arrows are coming back to thrill us with their breathtaking aerobatic display. The district council and Folkestone Town Council have again made funds available to pay for the Red Arrows display”. The Royal International Air Tattoo was given a boost this week after the RAF announced which aircraft would be starring along with the Red Arrows in this summer’s flying programme. Legendary aircraft such as the Lancaster, Spitfire, Hurricane and Dakota will be joined by the RAF’s state of the art multi-role combat aircraft, the Typhoon and the basic trainer aircraft, the Tucano on Saturday July 12 and Sunday July 13. The Typhoon and Tucano will also be flying on Friday, July 11, as part of the special Red Arrows Pit Day. 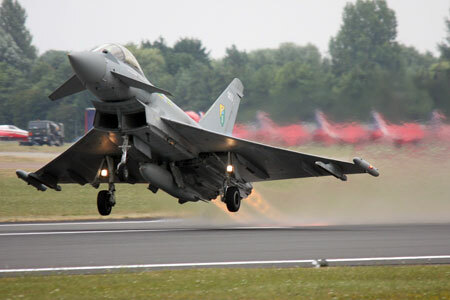 The power and agility of the Typhoon makes it one of the most eagerly anticipated performers at the airshow. Piloting the multi-role combat aircraft in 2014 will be Flt Lt Noel Rees from 29 (Reserve) Squadron based at RAF Coningsby. Demonstrating the capabilities of the Tucano,which provides basic fastjet flying training to RAF and Royal Navy student pilots, will be Flt Lt Dave Kirby. The aircraft, which features the Royal British Legion logo, poppies and the words ‘Lest we Forget’, is operated from No 1 Flying Training School, at RAF Linton-on-Ouse. As well as enjoying RAF aircraft in action, visitors to this summer’s Air Tattoo will be able to get close to a wide range of RAF aircraft parked in the Showground. There will also be the opportunity to meet many of the pilots and crew. 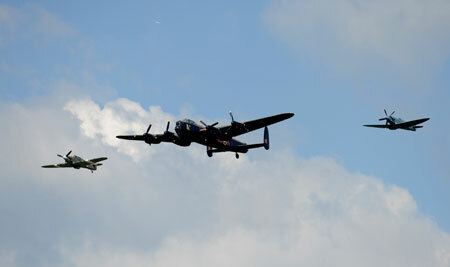 The Air Tattoo is staged annually in support of the RAF Charitable Trust. Tickets for the event are only available in advance. Specially-priced Earlybird tickets for next summer’s Air Tattoo, on July 11-13, are available until May 31 from www.airtattoo.com or by calling 0800 107 1940. All accompanied under-16s go free. Free parking.